The pair of vultures in the nest tree. Turkey vultures live in our area year round. In February, a pair claims the nest. I don’t know if it is the same pair each year. I went out into our backyard to get some reference photos of lighting on the trees. Just as I raised the camera to my eye, I hear an odd squeaky grunt from the west. I did not recognize the creature making such a sound. It did not sound like the call of a bird, nor did it sound like a critter on the ground. Quickly, I lowered the camera for a look. I saw two turkey vultures tangled in a mating embrace in the nest tree just south of the big pond. I switched the camera to video to catch the moment and only managed to get the afterglow fluff of feathers. Turkey vultures are very secretive. We lived here for almost ten years before we realized they were nesting in the hollow of an oak tree just south of the big pond. Even more years before we saw the nesting pairs enter and leave the nest. 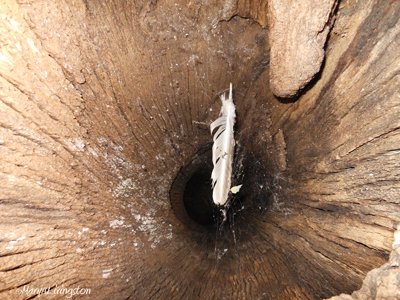 The hollow of the tree extends fourteen feet to ground level. By the time the chicks can climb out, they are old enough to fly. The next day, I watched from the workroom for the vultures to return to the tree. I hoped to catch them. Then they came, one after the other into the tree. I turned off the equipment and rushed out. I don’t usually take a rushed break in the middle of the work day, but I was on a mission. I slipped around a tree to the southeast of their location and waited. The vultures, the aware bird that they are, already spotted me and were staring in my direction. Then they flew overhead and if they had voice boxes, I am sure they would have sounded a laugh. So it begins, the nesting of the turkey vultures in our backyard. I will keep you posted. As for me, I returned to work a little more productive after sneaking a little bliss. Hollow oak tree. The vultures nest in the cavity every year. The entrance is 14 feet off the ground. to give you size perspective, I am 5’9″ tall. A shot into the cavity of the tree where the turkey vultures raise their young. This entry was posted in Nature, Photography, Turkey Vultures, Uncategorized and tagged D200, nature, Nikon, photography, turkey vulture, vulture, vulture nest by MaryALivingston. Bookmark the permalink. I’m learning so much from you about turkey vultures. We have more coming into our yard in the country than in years past. Maybe there’s a nest tree nearby. Hmmm… I have seen them in an oak tree. Worth checking out. Aren’t you illustrating a book about turkey vultures? Are you writing it too? What kind of camera and lens do you use? I love your photography. Your posts fascinate me. Wonderful moment of bliss. Glad you took it and shared it with us. Turkey vultures are opportunistic nesters. They do not build a traditional nest, rather they use existing shelter. Usually it is on the ground somewhere or in an old unused building. 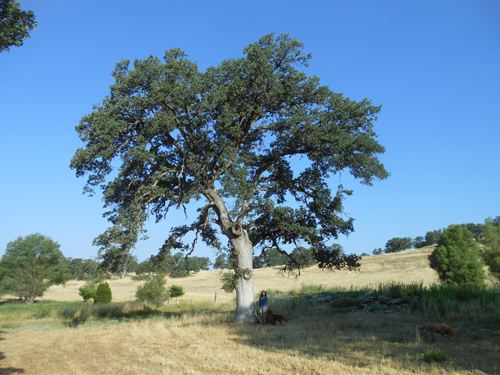 We have an abundance of hollow blue oak trees. These were shot with a Nikon D200, lens AF VR Nikkor 80-400. We get turkey vultures on Cape Cod too. Surprisingly! Kind of creepy! We have none here, but it is great to discover them and read learn via your beautiful experience. Early settlers called them “buzzards” mistaking them for an old world hawk. The nickname stuck. PS That is a very pretty tree. They are well known as carrion feeders. We live near a creek where salmon spawn, I really appreciate their presence. loved reading about these creatures… I really love that last picture! The hole smelled as bad as you might think. I was very surprised to see how deep it was. Check in to see more pictures tomorrow… I stalked a lot of turkey vultures while researching No Place for UGLY Birds. I love turkey vultures, we have loads here along the escarpment. What a gift-a backyard nest. Keep us updated! I am going to try to set up a security camera to watch. The 300 feet of cable just arrived. We have a rather large group of them that stick together in my neighborhood. Two years ago, when we first moved here, I told eldest daughter how they tend to hang out in areas after things have died, etc. She started asking me if we were really dead, then starts running and screaming down the street “I’m dead, I’m DEAD! !” It was too funny. Now if I don’t see them for a while, I wonder where they’ve gone. But they always come back. That is funny I can see it. My sister-in-law is from Costa Rica, I do believe it is time for another visit. Thanks for stopping by. Thanks for an interesting account of turkey vulture behavior. They are seasonally common in my area, but it took years of searching by bird enthusiasts before any one found an active nest! It took us years to find this one and it is in our back yard. They are so secretive. We watch the fledglings come and go at about branching age. The presence of fledglings was how we discovered the nest. 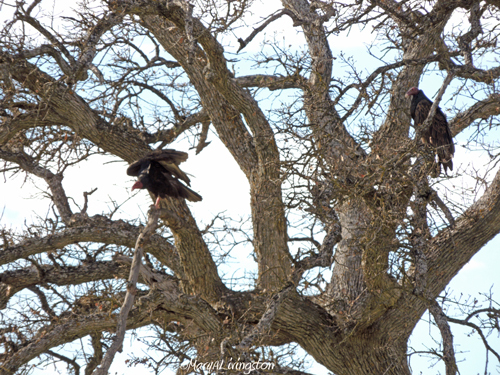 When I lived in the country there were turkey vultures that nested near where I walked my dogs. On close inspection they look so mournful! Your photos are great!